I can’t promise that this is the exact recipe that Myron is using for competition ribs right now but it should get you pretty close. Myron cooks ribs two different ways depending upon the type of competition. Myron smokes baby back ribs for Memphis in May competitions and switches over to St Louis spares for Kansas City Barbecue Society events. For both types of contests Myron is simply cooking the type of ribs that the judges expect. The main difference between how Myron cooks spare ribs and baby back ribs is the temperature of his pit. Baby back ribs get smoked at 250F while St Louis spares get smoked at 275F. The St Louis spares get smoked at a higher temperature as they have a higher fat content than baby back ribs. The higher heat helps the fat render from the St Louis ribs. Start by removing the membrane from the back of the ribs and trimming off any excess fat. Place the ribs in an aluminum pan and cover with the marinade. Wrap the pan in aluminum foil and refrigerate for four hours. After four hours remove the ribs from the marinade and pat dry with paper towels. After the ribs have been patted dry it is time to season them with the dry rub. Apply the rub to the top, back and sides of the ribs. Let the ribs stand at room temperature for 30 minutes as the rub works its way into the ribs. As soon as the ribs have been coated with rub you need to make sure your smoker is at the right temperature; 250F for baby backs and 275F for spares. Myron likes to use peach wood for ribs. Most folks don’t have a local supply of peach wood. Here are some links to pick some up on Amazon. Myron does not place the ribs directly onto the grate of the smoker. Myron places the ribs, bone side down, in an aluminum foil pan and places the pan in the smoker. Myron cooks EVERYTHING in pans. I think this is a trick he uses to keep his smoker clean. The ribs get spritzed at the 30 minute mark and every 15 minutes thereafter until the ribs have been smoked for two hours. After the ribs have smoked for two hours remove the pan from the smoker. Pour one cup of apple juice into the pan and cover the pan tightly with aluminum foil. Place the foil covered pan back on the smoker for one hour. While the ribs are cooking in the foil you will have time to prepare the sauce for the ribs. This is what Myron calls his Hog Glaze. Start by making a vinegar sauce. Combine the following ingredients and warm (but don’t boil) until the sugar and salt have dissolved. To finish making the Hog Glaze take two cups of the vinegar sauce and combine it with two 18 ounce jars of apple jelly and two cups of light corn syrup. After the ribs have cooked in the foil for one hour remove them from the smoker and transfer them to a clean aluminum pan. Brush both sides of the ribs with the Hog Glaze and cover the pan with aluminum foil. Place the covered pan back on the smoker for 30 minutes while the sauce sets. Myron says he shuts off the heat to the smoker in this last step. He uses some big smokers so even when it shuts it down there will still be plenty of residual heat left over to cook the ribs some more. After the sauce sets and the ribs are at the tenderness he wants Myron pulls them from the pit and sends them to the judges! Myron has given bits and pieces of this technique in multiple locations. I haven’t shared anything here that wasn’t already publicly available on the Internet. 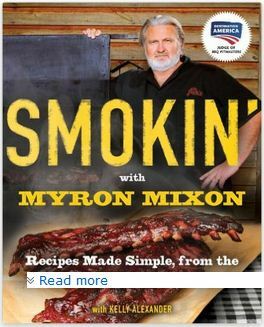 There are variations to this recipe compared to what is in his book (Smokin’ with Myron Mixon ). What is in his books is a little different than what he teaches in his on site competition barbecue classes. I don’t think Myron is being deceptive in having multiple versions of his rib recipe. I am sure that his methods are always evolving. Another great championship rib technique is Johnny Trigg’s. I do not have an official source to reference but there are plenty of versions of his technique on the Internet. 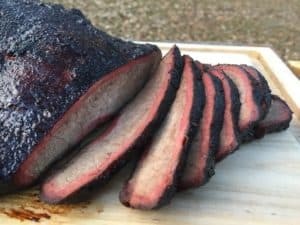 My buddy, Sol, sells the rib rub Johnny Trigg uses and has published a synopsis of the technique. Here is a link to Sol’s site where he sells the Rib Tickler Rub that Johnny uses. By the way, here is Myron’s brisket recipe as well. Hey great post on techniques! I’ve wondered about how these Gus work. I see bits and pieces and you kinda brought it all together. Mike and Amy Mills is one of my BBQ heros! I met him at the Nugget Rib Cookoff last year 2013. Two of the nicest folks I’ve ever met! My ribs still came out a little tough..
Great post! Folks love to try out rubs that provide that competition quality flavor! Will pass this article along as a resource! Gotta try it love the show people love my ribs I just can’t reach the taste achievement I’m looking for. I think the amount of salt in the marinade is off. Should be one cup per gallon for standard wet brine. This is over double the amount and my ribs were a bit salty. I have used his method before except on the marinade and they were delicious without the marinade. You could be right…I took the recipe directly from the GMA interview linked in the post. It might have a typo or maybe it is meant to be salty for a big first bite impression? Two parts coarse blk pepper to ONE part kosher salt……. Myron Mixon will NOT tell you his secrets unless MONEY is involved. You have the cash, he’ll tell ya a few things you need to know. FACT !!! He even said so on TV.